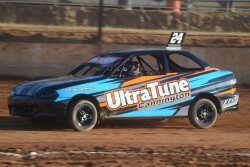 The first Speedway Sedans Western Australia State Title of the season will be held this weekend at the Attwell Park Speedway in Albany on the state's south coast. Racing will take place this Saturday 19th and Sunday 20th January 2019 with a field of nearly fifty competitors set to do battle. The Albany Speedway Club last hosted the Junior Sedan State Title during the 2010/2011 season with the event being held at Attwell Park for the sixth time. Defending champion Todd Aktins will not defend the title with Blake Webb the only driver in the field who has finished on the podium previously with a third place in 2015/2016 in Broome. Blake Iwanow has already won nine feature races this season and will prove hard to beat with drivers coming from all points of the state to contest the event. Official Practice will be from 3-5pm on Friday 18th January with racing getting underway at 6pm on Saturday Night and 5pm on Sunday evening..